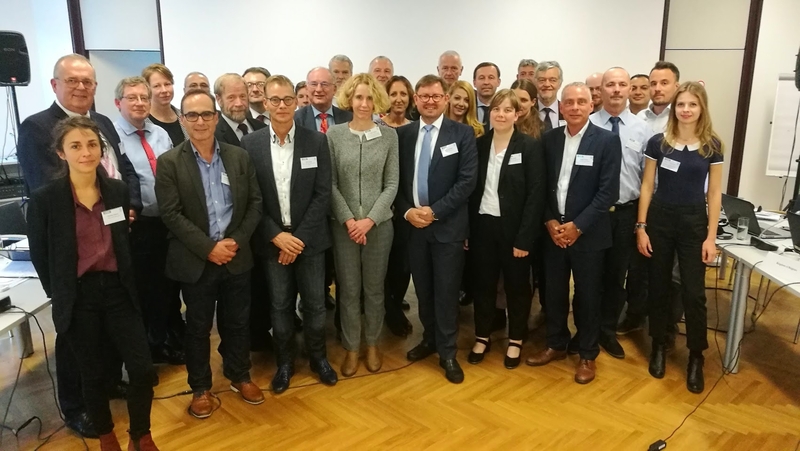 Vienna, 31 October 2018 – Wednesday, 31 October 2018 saw the first meeting of inland navigation waste experts from 10 member states of the Danube Commission and the Convention on the collection, deposit and reception of waste produced during navigation on the Rhine and inland waterways (CDNI) with the friendly assistance of the Austrian Federal Ministry of Transport, Innovation and Technology, which created an excellent environment in which to organise this joint meeting. Austria was an appropriate choice of host in several respects: Austria holds the Presidency of the Council of the European Union until 31 December 2018; as a Danube riparian state the country is also a Member State of the Danube Commission (DC) and enjoys observer status with the Convention on the collection, deposit and reception of waste produced during navigation on the Rhine and inland waterways (CDNI). This meeting, which focused in detail on the CDNI, already in successful operation, is part of the thinking that has been going on for several years within the Danube Commission on how to modernise its own recommendations and develop a binding regulatory framework. Better waste management and disposal for inland navigation at international level is intended to contribute to environmental protection. This meeting saw open and constructive discussions between the approximately 40 experts, resulting in a detailed overview of the current situation concerning the reception and disposal of waste produced during navigation of inland waterways, both within the scope of the CDNI, the Rhine being its largest waterway, and on the Danube. In order to be able to carry on cross-border inland navigation in Europe in accordance with guidelines that are as consistent as possible, both sides advocate the greatest possible harmonisation of provisions. Structural differences (fleet size, available infrastructure, etc.) should not be an obstacle to this. By the time this meeting concluded, the desire for collaboration had already resulted in discussion of several other possible collaborative ventures. The Danube Commission will continue its efforts of recent years to harmonise its own recommendations on the handling of cargo waste with CDNI requirements, but is aware that ultimately only a binding regulatory framework will meet the requirements for environmentally friendly waste disposal. To that extent, accession to the CDNI Convention would be one conceivable approach. Concrete discussions on this matter will follow. and at https://www.cdni-iwt.org/de/abfallarten-2/ you can see an animated film of the Convention’s 20-year long existence.